A surprising amount has been written and recorded about Max and his world. This page is a start on listing all articles, critiques, panels, round tables and video retrospectives that focus on Max. 3.2 "The Mystery of the Creepiest Television Hack"
While the era was short, Max generated a tremendous amount of interest in the entertainment media, and it seems as if every magazine and major newspaper wrote at least one article about him and his shows. This is an incomplete list of those articles - which is distinct from the print interviews. 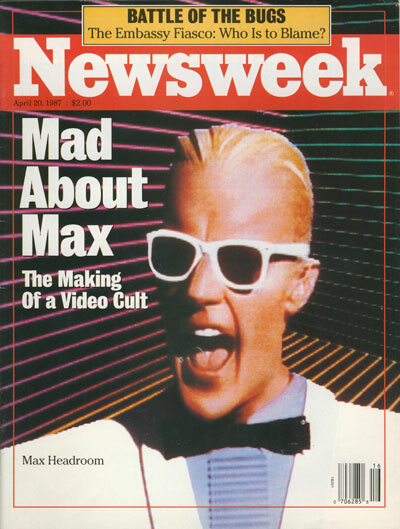 Max made the cover of Newsweek just as the ABC series hit its brief peak, with a six-page article about the entire Max phenomenon and a one-page "interview." This issue of Newsweek is in the MaxRchives; inquiries about the contents are welcome. Around the major anniversaries of the Max Headroom era, various groups including television museums and fan groups have assembled one or more of the cast and creative team to discuss aspects of Max. Stay tu-tu-tuned on this one. There have been a sprinkling of articles about Max or some Max-related topic over the years, mostly rather shallow "Whatever happened to..." or fan writings. As the 25th and then 30th anniversaries passed, and with the release of the commercial ABC series DVD set, a new generation of articles appeared, mostly longer, more thoughtful and more deeply written. We'll list the best of the best here. 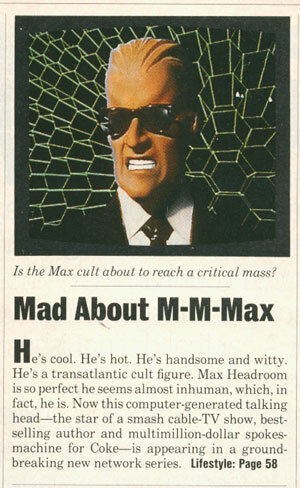 A topic that's drawn many writers over the years is the story behind Max Headroom. While a book-length telling is still missing, the space for a detailed new-journalism writeup of all the people and events that went into Max's creation and development has been adequately filled by Bryan Bishop. "The Mystery of the Creepiest Television Hack"
If there's one Max topic that's received continuing attention over the years, it's one that the real Max had nothing to do with: the November 1987 pirate-signal hacking of two Chicago television stations. Besides a dozen or more instances, analyses or postings on YouTube, articles and blog entries recycling the details are plentiful. You can skip nearly all of them in favor of Chris Knittel's long and insightful writeup - so good it let me skip writing my own here, at least for some long while. This page was last modified on 5 December 2015, at 16:02.